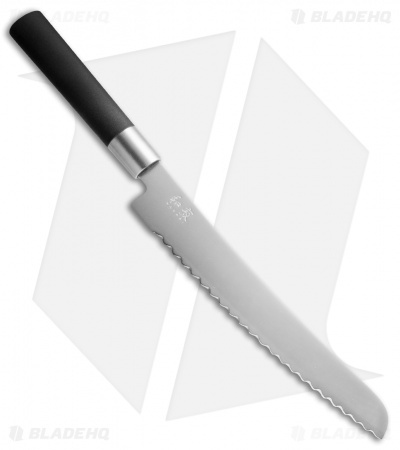 Features serrated edge for cutting through bread effortlessly. Wasabi Black – satin blade, black handle: these Japanese designed knives feature a stainless steel blade with a hardness of 58 ± 1 HRC that lend your kitchen the unmistakable Far Eastern flair. A handle has been developed for the Wasabi series that offers the optimum hygiene thanks to the special combination of bamboo powder and polypropylene – assisted by the natural anti-bacterial properties of the bamboo parts. In contrast to the traditional Japanese wood handle the black handle is not inserted but embraces the blade completely. 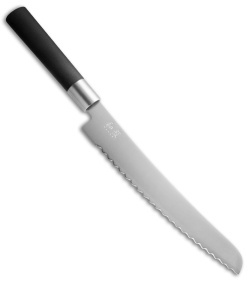 Thus the blade is closely connected to the handle, not allowing dirt to settle in any gaps.